Joining Amerika Now during the first hour are renowned Egyptian archaeologist and anthropologist Dr. John Ward and publisher of Intrepid Magazine and Founder of the Paradigm Symposium, Scott Alan Roberts, to discuss their book The Exodus Reality: Unearthing the Real History of Moses, Identifying the Pharoahs, and Examining the Exodus from Egypt. Is Moses and the story of the Exodus anything other than religious legend or Biblical myth? The character of Moses and the topic of the Exodus are historical enigmas that have given rise to entire branches of Egyptological study and research for centuries. Find out tonight as Scotty and John discuss the story of The Great Exodus as well as who the real Moses may have been. Scott Alan Roberts is a man of diverse interests and a fairly eclectic background. He’s the Founder and Publisher of Intrepid Magazine as well as the Founder of the Paradigm Symposium. He attended Bible College and entered into a Masters of Divinity program in theological seminary in a fundamentalist academic setting. He then joined the U.S. Marine Corps and eventually entered the ministry as a youth pastor. All of these experiences were to prepare him for the next 30 years, which he spent in advertising and publishing. In addition to The Exodus Reality, Scotty is the author of The Rollicking Adventures of Tam O’Hare, The Rise and Fall of the Nephilm, and The Secret History of the Reptilians. Scotty has also written articles for TAPS ParaMagazine (the official publication of SyFy’s Ghost Hunters) and was also their Editor-in-Chief from 2009-2010. 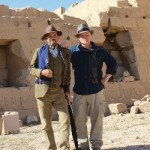 Dr. John Richard Ward is an archaeologist and anthropologist residing in Luxor, Egypt. Over the years, Dr. Ward has conducted numerous investigations of ancient Egyptian architecture and symbolism while also carrying out research into the many mysteries surrounding medieval Templarism. In 2006, Ward was recruited by the Knights Templar of Britannia, which is a modern order affiliated with and acknowledged by the Vatican. With the help of his partner, Dr. Maria Nilsson, Ward has managed to track the use of particular symbols through the various dynasties and geography of ancient Egypt leading all the way to the present. Many of Dr. Ward’s projects and activities are far too numerous to include here, however, those listed herein will certainly spark interest to many, including his research into and by The Sirius Project, The Western Saharan Desert Expeditions, In the Footsteps of Howard Carter, Masons or Priests, Medieval Symbolism, The Mappa Mundi, The Blemmies, and An Introduction to Luxor Temple. If you’d like more information on both Scott Alan Roberts and Dr. John Richard Ward, visit their website http://www.exodusreality.com. CALL 800-259-5791 TO SPEAK WITH SCOTTY AND JOHN. Making a return appearance on Amerika Now is renowned spiritual leader Dr. Robert Forman, who will be discussing the SoulJazz Program: Bringing Soul to Life and Relationships. What would life be like if you could actually create all the deep and meaningful connections you’ve been longing for in your everyday relationships? If you’ve ever wondered how to create more genuine connections with yourself, your friends and others, then listen in, because Dr. Robert Forman rejoins the show tonight to talk about the SoulJazz Program. Many of us long for more intimacy, more connection. You may have felt real intimacy during a late-night conversation with a close friend when, all of a sudden, the conversation “dropped down” and you seemed to really be seeing them and they you for the first time. Or perhaps a feeling of being connected with yourself, “really here,” came while you were listening to music, when somehow you seemed to rise above your everyday anxieties. At times like these, we feel so linked in that the world is okay and, despite it all, we are too, right? We call these moments of Soul, times in which we feel connected, intimate, that we care and are cared for. Wouldn’t it be wonderful to live with such Soul, every day? This problem is particularly acute in those of us who are “spiritual.” We can open sometimes to the spirit on the meditation mat or the Church pew, but still struggle with our spouse or our boss and mutter at the traffic! Spiritual depth does not always foster intimacy, connection, or care. Soul work does! SoulJazz trains you to understand and develop the skills to build a life, in your world, with your friends and loved ones, of just such deep connections and honest authenticity—every day. It offers you know-how, effective tools, a safe space to practice and real help and support for bringing more intimacy and connection into your life, loves and communities. Not just when you’re attending worship services or meditating, but in your everyday life and world world. You know: a life of Soul! If you’d like more information, please visit http://souljazzonline.com.